Wife-able Wednesday: Work Smarter… – Millicent You. Have you ever felt lazy? Have you ever been disillusioned about the whole rat race of work? Have you ever had dreams but didn’t want to work for it? This may seem random but I often am so please allow me to study the secret life of bees and ants for this project that I am doing called my LIFE. I have looked into the way they buzz about and how there are different roles inside the hive each fulfilling their tasks and contributing to the success of the whole. I guess in many ways I am seeing myself as a worker Bee right now or maybe more so an ant though I really like the fuzzy yellows. How important is their task as a worker Bee Worker activities include things like Honey sealing, Drone feeding, Queen Attendants (days 7-12), Honeycomb building, Pollen packing, Propolizing, Mortuary bees, Fanning bees, Water carriers, Guard bees, Foraging bees (days 22–42)(ASU school of Life Science). (I Pause and note to self) this sounds much like my tasks (admittedly not verbatim) of faith-building, home-keeping, engineering (day-job), ministry planning, encouraging, writing, sharing the word etc. I even found out that worker Bees are responsible for homeostasis inside the hive if it is too hot they deposit water in the cells and fan the area to temperature regulate by evaporation. Then I look at the ants how they militantly march in purpose and I have learned some smart techniques from spying on their ways. Apparently, like humans, ants are social creatures who live and work in a highly organized society/colony. In fact, most ant colonies are so united toward the common purposes of survival, growth, and reproduction that they behave like a single organism or a “superorganism.” Just as an individual ant has different body parts that fit and work together, an ant superorganism has multiple colony members that cooperate to accomplish extraordinary feats. 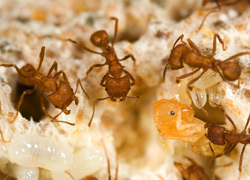 This social behavior gives ants a major advantage over solitary insects and other animals. (ASU school of Life Science). So as I studied the ant I am finding strategies for my life and my ethic. Ants always put their families first. Each colony is a close-knit family, usually including a mother (queen), her adult daughters (workers), and brood (eggs, larvae, pupae). In addition, ant superorganisms undergo their own sequence of changes called the colony life cycle. I really love family so this little tid bit is dear to me lol. So from studying these creatures, we can pull out some of these key points for our own smart work lives. Be a ‘Social’ Worker : Ok this may be tricky for some people who honestly claim they work so much better on their own but there’s an African proverb I’ve always loved that says “If you want to go fast go alone but if you want to go far go together “ so allow others to help when you know it will be beneficial to accomplishing a task don’t get bogged down with trying to claim victory over completing a task on your own: for bragging rights. That’s Pride, get rid of it. Find your tribe of like minded individuals and kick-start your ideas if you are an entrepreneur (which I believe we all can be). Or if you work for an organization find a mentor or encourage someone. Be Organised: Make a plan! Know your task before setting about to do it, so spend some time planning before you jump in and then execute it avoiding any distracting or competing tasks. : Get stuff done! Communicate: Communication I think is part of the social nature but here I want to stress the need for clear and effective transmission of information in all of your interactions this will help for work partners but also is effective for life. Be Diligent: Work consistently and effectively, form positive habits and stick with it. Be aware of cycles: Understand that there are life cycles to your work life and life generally plan with the knowledge of how you operate. Being self-aware can help you as you go forward informed. For instance knowing you don’t like carrying work home means you need to create a strategy for avoiding that. Find out and know what’s effective for you and develop your system. You work long hard hours and you come home exhausted but you know your purpose and the importance of your task. Or are you someone who is lazy and doesn’t care too much about working, thinking you’ll just marry rich? I believe we should come into a marriage with the ability to earn or already doing so. So let’s be Goal Diggers, not Gold Diggers. We certainly should be workers whether in or out of the home or both. I know you’ve heard the saying to work smarter not harder and I struggle with this notion in many ways. I believe that there should be a balance so, yes work hard but also rest and take stock of your environment, your body, your soul and make sure that these are being taken care of. What about the work of the Lord? If we are viewing things correctly it all belongs to him. I don’t believe in working to the detriment of your spirit. So perhaps working smart entails working in a way that is conscious of our eternal purpose? Working always as unto God. Work as worship. Whilst I do think it makes sense to work smart you would be foolish to think that hard work was not required. Wouldn’t you? If anyone has advice please send it my way I need your help lol. What are your methods of working smarter? And your need like [c]an armed man.